The NHS is “haemorrhaging” nurses with one in 10 now leaving the NHS in England each year, figures show. More than 33,000 walked away last year, piling pressure on understaffed hospitals and community services. 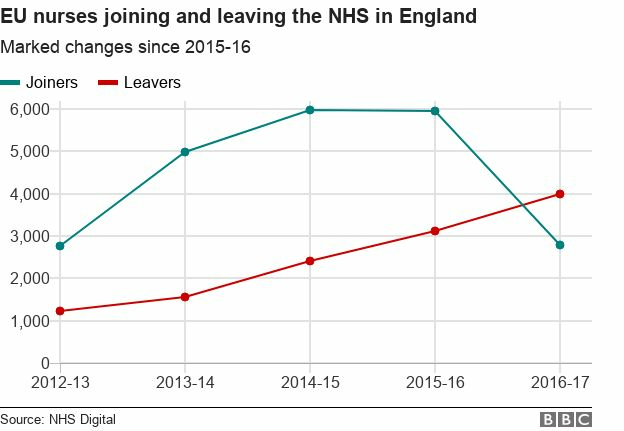 The figures – provided to the BBC by NHS Digital – represent a rise of 20% since 2012-13, and mean there are now more leavers than joiners. Nurse leaders said it was a “dangerous and downward spiral”, but NHS bosses said the problem was being tackled. The figures have been compiled as part of an in-depth look at nursing by the BBC. 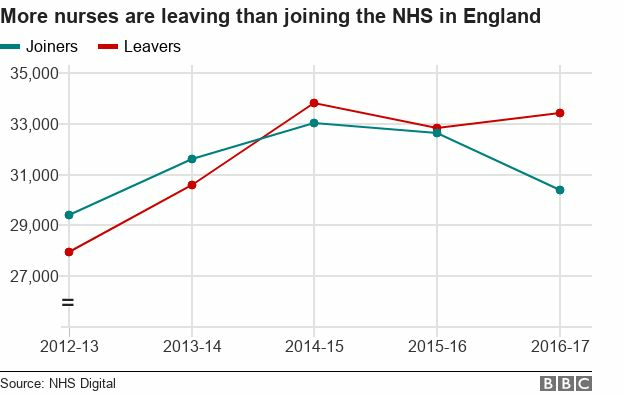 Other parts of the UK are also experiencing problems retaining nurses. In Northern Ireland and Scotland, the leaver rates are rising. In the most recent years, 7.5% of nurses left NHS employment in Northern Ireland and 7.2% did so in Scotland. But in both nations, the number of joiners outnumbered leavers. In Wales there were more leavers than joiners, according to Freedom of Information reports.